Latest in Matune/Sandack Race: "Creepy Cicero Outsiders"
Early this morning, we were tipped this image in our inbox (if you have something you want us to check out...remember...drop us a line at tipthetruthteam@gmail.com). 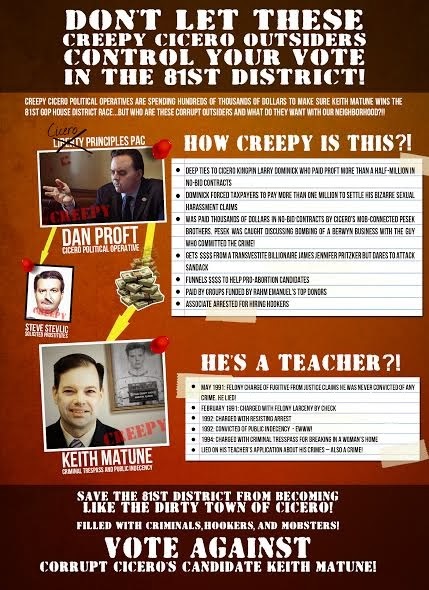 In what appears to be the latest salvo in the Ron Sandack/Keith Matune slugfest (remember...we're supporting Sandack because he's good for the ILGOP), the attack is now focusing on the messenger (Dan Proft). We've seen this before ("Don't let Chicago-style Politics...") but this is the first time we've it used against Proft.